Amy Nash grew up with a love for performing, and has been involved in musical theater through much of her childhood. 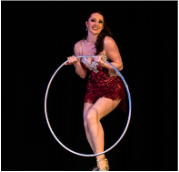 She discovered her passion for circus in 2009, when she began studying general aerials (trapeze, hoop, silks, and spanish web) at her local circus space. acrobatics and physical theater training. She now tours internationally in Europe since the summer 2013.